Physically they were quite similar: both small and wiry. Perhaps because of their similarly traumatic childhoods (Dickens haunted by family debts, the threat of prison and his period in the blacking factory, Chaplin buffeted between workhouse and orphanage because of an absent father and a mentally unstable mother) they are made precociously aware of life’s misfortunes, and, in response to this, they are similarly drawn to images of innocence in their work and lives, an innocence that they themselves have missed. One thinks of Dickens, in his work, with those child-women heroines, like Dora in his most autobiographical novel, David Copperfield, or Little Dorrit, who seems to stay little, however old she gets, and, in his life, his association with Ellen Ternan when he’s 45 and she’s 18 which leads to his separation from his wife. 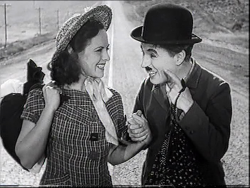 Chaplin too, with his four marriages to teenage brides, culminating in his marriage to Oona O’Neill (daughter of the great playwright Eugene O’Neill), when he’s 54 and she’s 18, a marriage that actually turned out to be an extremely happy one. Their attitudes to women and their depiction of heroines seem to be a mixture of adoration and misogyny, deriving from mother figures whom they loved but by whom they also felt in some way betrayed. For example, in Dickens’s case, when all the debts had been repaid and the family reunited, his mother had suggested that perhaps young Charles could remain at the blacking factory which he so hated rather than find some schooling; it is said that Dickens never quite forgave her for that. Similarly, Chaplin’s love for his mother was always mixed with a frustration and anger at her mental illness, an anguish that she’d not been able to protect him from a premature awareness of the harshness of the world (his father had abandoned the family when Charlie was seven). Similarly their popularity was quite unprecedented and it’s interesting that when Chaplin’s popularity was being discussed in the 1920s and 30s, Dickens was often invoked as a comparison. I always loved the story concerning Dickens’ popularity which extended to a situation where, when British ships were coming into New York harbour, they were receiving frantic signals from the shore saying ‘How is little Nell?’ When Chaplin visited London in February,1931 for the premiere of City Lights, The Times wrote: ‘Dickens knew something of popular enthusiasm, but could he have beheld the press of people gathered…in honour of Mr Chaplin, he might have rubbed his eyes in astonishment.’6 It is said that, during one visit to London, Chaplin received 73,000 fan letters from the capital alone. His popularity was such that it became something of a psychopathological phenomenon, notably on an occasion on 12 November 1916 when Chaplin was allegedly spotted in 800 places at the same time. I think that’s one of the great passages in Dickens. He’s not idealising humanity (he’s careful to balance ‘good’ OR ‘evil’, ‘love’ OR ‘hatred’ etc.) but he’s still recognising and cherishing the rich complexity of humanity, even in – perhaps especially in – what he calls the ‘soul… of its quiet servants’. He goes on: ‘There is no mystery in it [i.e. the engine, the machine]; there is a mystery in the meanest of them, for ever.’ I’m sure Chaplin would have responded to that. When his silent features were re-released during the sound era and he added a commentary, he would refer to the Tramp as ‘The Little Fellow’- and was heavily attacked for his so-called ‘condescension’- but what he was thinking of, I believe, in that phrase was precisely the equivalent of Dickens’s ‘the meanest of them’, those people who are up against it, whom society marginalizes and whom governments sometimes do not even acknowledge as a statistic, but in whom (both Dickens and Chaplin would insist) there is still a mystery and depth that deserve recognition. The Tramp is the kind of figure Society would ignore or even disdain, but, as James Agee asserted in his classic essay on silent film comedy, ‘Comedy’s Greatest Era’, the Tramp character in Chaplin’s hands was ‘as centrally representative of humanity, and as many-sided and mysterious as Hamlet’.7 In Modern Times, the Tramp is an assembly-line worker who is being driven progressively mad by the repetitive routine of his job. 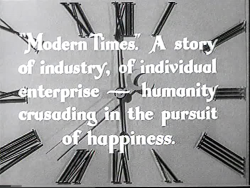 In an early sequence in the film, an inventor has visited the plant with his revolutionary contraption: an automatic feeding-machine that will eliminate the lunch-hour (and hence accelerate production and maximise worker efficiency) by feeding the worker whilst he continues to work at his job. The manager is impressed but insists that the machine be tried out on one of the workers. Inevitably the Tramp is chosen for the demonstration, and chaos ensues, with the contraption attacking the man before self-destructing. Reviewing the film at the time, Graham Greene thought that that was the best scene Chaplin had ever done; and, with typical scrupulousness, he described it as ‘horrifyingly funny’. Greene rarely used adverbs so his use of ‘horrifyingly’ there is doubly striking: he recognises the human horror behind the comic conceit. The scene is essentially about the depersonalisation of the individual; and whereas the breakdown of the machine is comical, the kind of managerial strategy it exemplifies is not, and could lead to human breakdown – which in the film it does. I think you’ll see from what I’ve said about Hard Times and Modern Times that another similarity that Dickens and Chaplin shared was their social and political outlook; and indeed it has been discussed in very similar terms by the critics. Both of them have been described and even derided as sentimental radicals who were not great political thinkers or men of ideas and who advocated a change of heart more than a change of system. Carlyle was quite disdainful about Dickens’s political ideas: ‘He thinks men ought to be buttered up, and the world made soft and accommodating for them, and all sorts of fellows have turkey for their Christmas dinner.’ Curiously, when Modern Times was re-released in 1972, George Melly in The Observer wrote about Chaplin in very similar terms: ‘He’s always been appalled by inhumanity but has nothing to propose beyond mere kindness. His dream is petit-bourgeois: a chicken in the pot, grapes against the wall.’ Still, in an unjust, intolerant and oppressive society, even basic decency can sound menacing. Lenin might have been appalled by what he called Dickens’s bourgeois sentiment, but Tolstoy wasn’t; and George Bernard Shaw said that Little Dorrit alone had converted him to Socialism. George Melly might have found Chaplin’s social ideas ‘petit-bourgeois’, but they were deemed sufficiently subversive to prompt the FBI to open a file on him in 1922 that eventually ran for around 2,000 pages and which subsequently led to his exile from America for 20 years. When discussing the social ideas of Dickens, George Orwell was critical of those kindly benefactor figures, like Brownlow in Oliver Twist or Jarndyce in Bleak House, who help without dirtying their fingernails, as it were, or without doing anything to question the basic fabric of their society. As Orwell said, ‘Even Dickens must have reflected occasionally that anyone who was so anxious to give his money away would never have acquired it in the first place.’ But clearly Dickens did reflect on this: there’s that sardonic comment in Hard Times, when Gradgrind’s mean-spiritedness is encapsulated by his thought that ‘the Good Samaritan was a bad economist’: and in Great Expectations, Dickens will take the whole idea of the legacy and the benefactor to grotesque tragic-comic extremes. 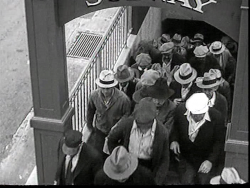 Similarly Chaplin, in one of his greatest films, City Lights, does his own brilliant variation on the benefactor theme when the Tramp, who has rescued a millionaire from drowning and is showered with money by the man when he’s drunk but treated with contempt when the man is sober, uses the money to finance the eye operation of a blind flower-seller, with whom he has fallen in love but who has deduced he is a gentleman. Like Magwitch in Great Expectations, he will wind up in prison (the millionaire will accuse him of theft); but when he comes out and passes the flower-shop in utter destitution he notices that the flower-girl can now see; and she, intrigued by this tramp figure who seems so interested in her, invites him in. It’s when they touch that she realises who her benefactor is; and it really is like the moment when Pip slowly recognises that his benefactor is the convict Magwitch and can barely conceal his dismay. If you know City Lights, you will never have forgotten the ending: when the flower-girl says, ‘You?’, and the film closes on one of the greatest close-ups in film history: the Tramp’s face at the point of recognition- apologetic, apprehensive, smiling his delight that she can see, but, unnervingly, through her reaction, also seeing himself. 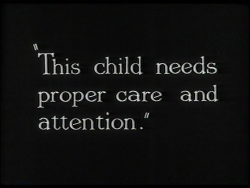 In the second film extract for discussion, I want to draw some connections between Chaplin’s film, The Kid, made in 1921 and Dickens’s Oliver Twist. It’s a film full of overt autobiography, and full of parallels to the Dickens novel. As mentioned earlier, Oliver Twist was the first book Chaplin ever read and it remained his favourite novel throughout his life. He would read it to his children, and it was the novel he was reading and re-reading, apparently, during the last year of his life, young Oliver’s experience in the orphanage approximating and reminding him of his childhood. The Kid was Chaplin’s biggest artistic risk at that time. It was three times longer than any film he had previously made; it was expensive to make, the ratio of used film (i.e. 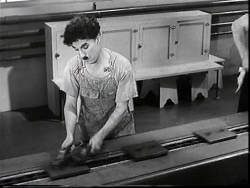 that which is seen in the completed film) to unused film being 1:53, which was high even by Chaplin’s perfectionist standards. It also had two ingredients that had not been so overt before – pathos (the opening title reads, ‘a picture with a smile, and perhaps a tear’) and social criticism, directed at the way society treats its unfortunates, here an unmarried mother, a tramp who stumbles across an abandoned baby and after initial reluctance looks after it, and a kid with no socially sanctioned parents. Like Oliver Twist, it begins with the tragedy of the unmarried mother and the child abandoned to its fate. 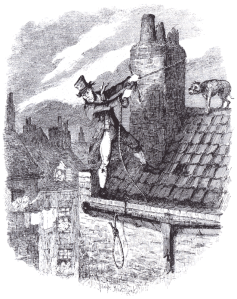 As it develops, the relationship between the Tramp and the kid becomes a genial variation on that between Fagin and the Artful Dodger as they go into business together: the kid will break people’s windows and five minutes later the Tramp will innocently come along to offer his services as a glazier. Also, in both The Kid and Oliver Twist, the big set-pieces are roof-top chases – in Dickens, to trap Bill Sikes after the murder of Nancy; and in Chaplin, the Tramp’s endeavour to rescue the little boy when he has been taken from him by the authorities. 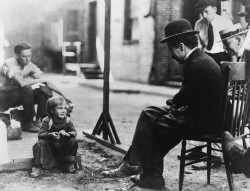 Prior to the sequence the little boy, played by Jackie Coogan, has been ill and the Tramp has sent for the doctor, which is when the trouble starts. As we will see, the authorities attempt to take the boy from the Tramp, who is roused to desperate measures to rescue the boy from a tragic fate. I would argue that even Chaplin’s use of the intertitles there is very Dickensian: that is, when a sequence is introduced with the title ‘The Proper Care and Attention’, it is fundamentally ironic and critical, because what we are about to see is anything but; and I think he picked that up from Dickens and Oliver Twist, for Dickens’ critique of the workhouse authorities very often takes that same sarcastic form: for example, when he refers to ‘juvenile offenders without the inconvenience of too much food or too much clothing’; or when he refers to Oliver’s ‘auspicious and comfortable surroundings’ when the boy has been thrown into a small dark room after being flogged for asking for ‘more’. What Dickens is doing is parodying the workhouse authorities’ own language, their own justification for their actions, and irony and parody can be particularly effective tools for exposing and emphasising hypocrisy. This is exactly what Chaplin does in The Kid. ‘Proper care and attention’ is the Doctor’s phrase and we see in reality what that means. The brusque music and the pompous manner of the authorities emphasise that they are acting out of simple officiousness rather than out of any sense of care. 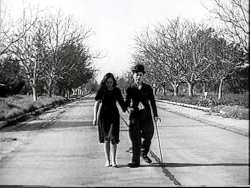 This was a very painful scene for Chaplin to film because it brought back all his childhood terror of officials like welfare workers, doctors, the police, as well as a specific incident when he was seven years old and brutally separated from his mother who was forced to move to Lambeth Workhouse whilst Chaplin and his half-brother Sydney were carted off to the Hanwell School for Orphans and Destitute Children. 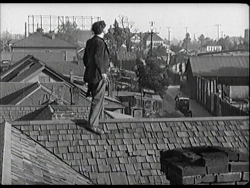 The roof-top chase would have struck audiences at the time as an unusual sequence in a Chaplin movie. Chaplin as a rule didn’t like chase sequences and this was one of the reasons why he left the Mack Sennett organisation: ‘does everything have to end in a chase?’ he moaned. But this is a chase scene with a difference: the emphasis is not on slapstick but on suspense. Audiences would have recognised that sending the kid to the orphanage was a potential death sentence, and that’s emphasised by the way the kid is thrown into the back of the truck as if he were an animal on the way to the slaughterhouse. 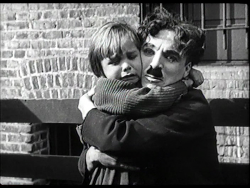 When the Tramp and the kid are re-united, it is noticeable that they are both crying; and, as Jackie Coogan was later to say, ‘for audiences at the time, to see this great clown, this mischievous tramp really crying was a considerable shock.’ There was a tangle of emotions at play here. 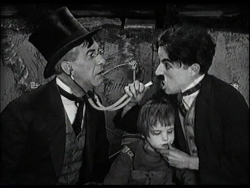 Prior to making this film, Chaplin’s first child, a boy, had been born malformed and died within three days; and the boy’s mother, Chaplin’s first wife, said later that one of the few things she remembered about their disastrous marriage was that ‘Charlie cried when the child died.’ During the making of The Kid, Chaplin had become very fond of little Jackie Coogan and, when preparing this scene, dreaded having to make the lad cry and called in the parents for help. 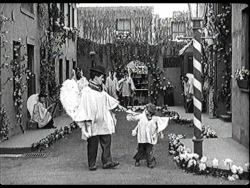 ‘Leave it to me,’ said the dad, and apparently, said to the boy: ‘Look, you little runt, you do what Mr Chaplin wants or I’ll send you to the orphanage myself!’ In fact, Coogan was the best co-star Chaplin ever had, for two reasons: firstly, he worshipped Chaplin, which always helped; and also he was a brilliant mimic. 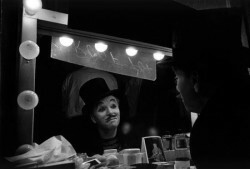 As Coogan was to say later, the problem for Chaplin was always that he wanted to play all the parts himself and could probably play them all better than anyone else, so his idea of direction was to demonstrate to the actor what he wanted, in order for the actor then to imitate what he had demonstrated. That worked a treat with the five-year-old Coogan but it didn’t go down so well with, say, Marlon Brando (in Chaplin’s last film, The Countess of Hong Kong). The Kid was to make Coogan a big star, and the search was on for a vehicle that would exploit his talents. One might have guessed what would turn out to be his first big starring role: Oliver Twist. As they grew older, their work grew darker, to the dismay of many of their critics. 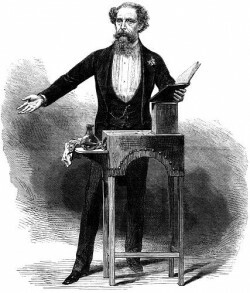 In the case of Dickens, one Victorian critic, E.B. Hamley was representative of many when he wailed: ‘In the wilderness of Little Dorrit we sit down and weep when we remember thee, O Pickwick!’ Why aim to be profound when you can just be funny? 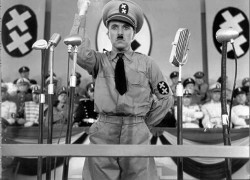 And, of course, exactly the same criticism was levelled at Chaplin when he finally opened his mouth in the Talkies in The Great Dictator (1940) and Monsieur Verdoux (1947), for me two of his greatest films. So many critics complained: who wants to hear your political opinions when you have the gift of laughter? Yet a young François Truffaut, in his notoriously combative days as a critic for Cahiers du Cinema, had the answer to that when he reviewed a reissue of The Great Dictator in 1957: ‘I despise the set mind that rejects the ambitious from someone who’s supposed to be a comic….If Chaplin has been told that he is a poet or a philosopher, it’s because it’s true and he was right to believe what he heard. Without willing it or knowing it, he helped men live; later, when he became aware of it, would it not have been criminal to stop trying to help them even more?’11 Up until the middle of the last century, Dickens was always being accused of exaggeration, but the critic Lionel Trilling was one who thought that people who said that had no eyes or ears. ‘We who have seen Hitler, Goering, Goebbels on the stage of history,’ he wrote, ‘are in no position to suppose that Dickens exaggerated in the least the extravagance of madness, absurdity, malevolence in the world- or, conversely, when we consider the resistance to those qualities, the goodness.’12 And, of course, it was the Nazi threat in Europe which persuaded Chaplin finally to break his silence in the Talkies era and to make his anti-Fascist satire, The Great Dictator, exploiting surely the most bizarre resemblance of modern history (even to the extent of almost the same birth-date): that between Chaplin and Hitler. 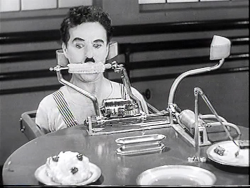 The great French critic André Bazin called it a settling of accounts: Chaplin’s revenge, he said, on Hitler’s double crime of elevating himself to a god and stealing Charlie’s moustache. 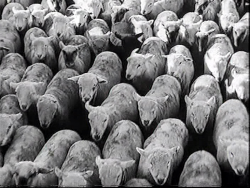 The film is a funny but ferocious attack on totalitarianism, holding it up to ridicule in the noble, if perhaps forlorn, hope that the ensuing laughter would make it impossible for such a political philosophy ever to be taken seriously again. It did not work contemporaneously, but Milos Forman has since commented how spiritually liberating he found the film when he was allowed to see it after the end of the war. 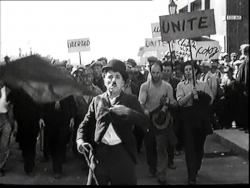 If that was Chaplin’s tribute to Dickens, what might Dickens have reciprocated for Chaplin? Surely an emotional death-bed scene, in which a revered old man, surrounded by his devoted family, dies peacefully in his sleep. Oh yes, and as an extra touch: make it Christmas Day. 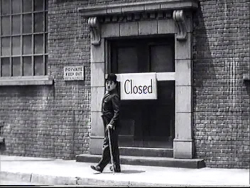 And, of course, that is precisely what happened: Chaplin died on the Christmas Day of 1977. As well as the sentiment, though, Dickens, with his love of the macabre, might even have provided the slightly grotesque epilogue to this event: namely, that Chaplin’s coffin was later stolen by two pathetically incompetent kidnappers who demanded a ransom for its return but who were quickly caught and the coffin recovered. This is a slightly expanded version of a lecture given at the ‘Adapting Dickens’ Conference at de Montfort University on 27 February 2013. This entry was posted in Talks and tagged Adaptation, Charles Dickens, Charlie Chaplin, City Lights, David Copperfield, Federico Fellini, Francois Truffaut, George Melly, George Orwell, Great Expectations, Hard Times, Jackie Coogan, Modern Times, Oliver Twist, The Great Dictator, The Kid by admin. Bookmark the permalink.